Garlic and Parsley Mix™ - 675 mg, 60 Vcaps™ each (Nature's Wonderland) - Penn Herb Co. Ltd.
During World War II, Garlic was used to keep soldiers healthy. Today, it's recognized as an outstanding way to maintain cardiovascular function, immune health, and cholesterol levels. And best of all, we've added the odor-fighting power of Parsley. 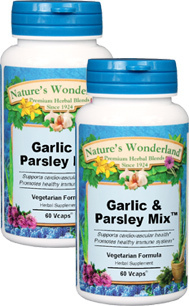 Nature's Wonderland Garlic & Parsley Mix™ is a convenient way to enjoy the legendary benefits of whole Garlic cloves. GARLIC...the 5,000 year-old spice supports circulation, promotes cholesterol wellness, arterial health and healthy blood pressure levels. Use with confidence too, because we've included PARSLEY, which contains chlorophyll and natural enzymes to help neutralize Garlic's strong odor. Make It A Part of Your Daily Health Program! As an addition to the daily diet, take 1 or 2 capsules, 3 times daily with water at mealtimes. NOT TO BE USED WHILE NURSING.